The newly identified ancient bird Pelagornis chilensis is one of the biggest birds ever discovered, with a gigantic 17 foot wingspan and spiny, teeth-like structures along its massive beak that it used to hunt fish and squid. Bird fossils are some of the most difficult for paleontologists to get their hands on, because bird bones are unusually soft and fragile. This makes them poor candidates for fossilization, and many bird fossils that do survive are badly crushed. 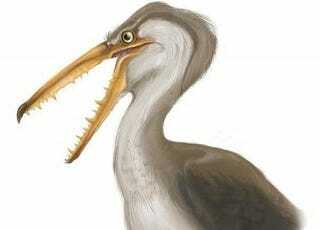 In fact, the only other bony-toothed bird skeleton we had before this new discovery was a single, mostly crushed fossil. That's part of what makes the Pelagornis find so remarkable - it's 70% complete and in pristine condition, giving scientists incontrovertible proof of its immense size and unusual teeth. Discovered in northern Chile, the bird's great wingspan allows scientists to better understand the physics of winged flight, helping them set an upper limit for maximum wing size. There are, in fact, some birds with even longer wingspans, most notably Argentavis, another ancient South American bird said to have a 19 to 26 foot wingspan. However, the fossil evidence for this bird is much less secure than that of Pelagornis, as we have had to extrapolate this wingspan estimate from very few surviving bones. Pelagornis, on the other hand, is the largest bird yet that paleontologists feel certain really did have the wingspan these measurements suggest.